Margaret Murie (b. 1902–d. 2003) and her husband worked as a team throughout their entire marriage (including their honeymoon) until Olaus’s death in 1963. During that time, they helped establish the Arctic Wildlife Refuge. After Olaus’s death, Margaret carried on their activism, and was instrumental in the passing of the Wilderness Act in 1964. For her efforts and accomplishments, Mardy (the first female graduate of the University of Alaska) was awarded the Presidential Medal of Freedom. 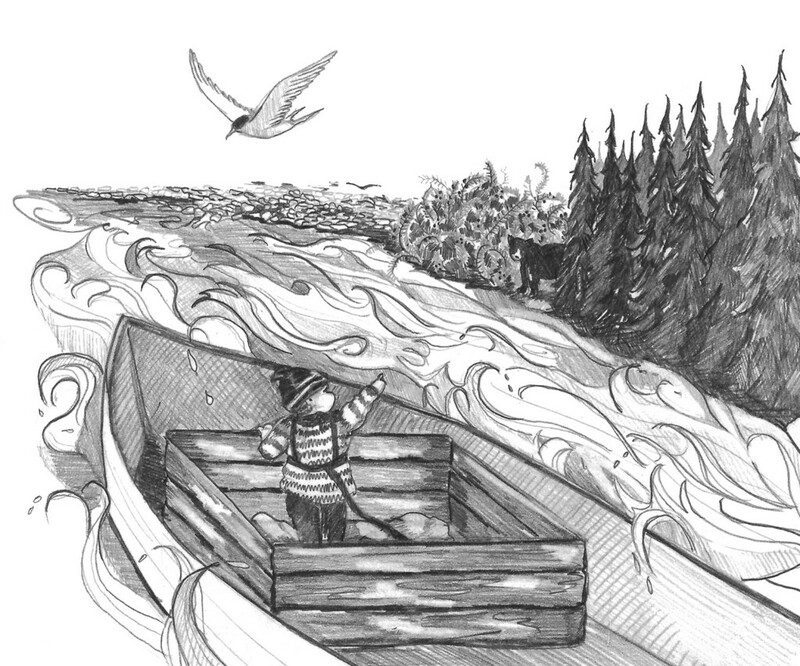 People thought she was crazy when, in 1926, Margaret “Mardy” Murie said she was bringing her 8-month-old baby on an expedition to band geese on the Old Crow river in the Yukon. But Mardy had never stayed behind on an adventure before, and she was certainly not going to start now. Leading the four-month expedition was Mardy’s husband Olaus, a wildlife biologist working for the U.S. Biological Survey. Their friend and colleague, Jess Rust, would be along as well. Mardy had been worried that Olaus would not want her to come, or that his boss wouldn’t allow it. Still, neither of them hesitated in moving forward. Mardy was a dedicated naturalist. She helped Olaus in the field, working alongside him at every opportunity. Being born and raised in the Alaskan frontier, she knew the north and not fear the wilderness, she relished it. So they eagerly set out as a team. Mardy and her son Martin shared a five-foot-by-five-foot space on the open boat, with the water rushing right there beside them. The baby slept and played in a wooden crate lined with rubber sheets and a sleeping bag, wearing a harness they tethered to the bottom so he couldn’t fall into the river. Every evening, they camped on the rocky shore. With the baby sleeping in the tent, or safely tethered and playing by the shore, Mardy and the men got to work. There were clothes to wash, baby food to make, and a long list of other chores. Out in the wild, Mardy enjoyed what she ironically called the “housework,” sometimes staying up as late as midnight to do it when the summer sun still shone. There were moments when she questioned her decision. Like when they surprised a black bear as they came ashore, and Mardy was left alone with her infant son. As the mosquitoes swarmed, she listened to the sounds of a struggle, not knowing if the men would return. Martin moaned in distress at the relentless biting of the bugs. Mardy hid her fear from the baby and wrapped his neck in citronella-soaked cheesecloth, covered his box in a blanket and sang him songs to keep him calm. Finally, the men returned alive. Her fear and doubt were fleeting. “[In] an hour’s time life was different. Baby was asleep in a safe tent,” she recalled in her book, Two In the Far North. Not long into their journey upriver, the the boat engine died and the team was stuck. Refusing to give in, Mardy agreed they must go on. Olaus, and Jess spent the next 350 miles pushing and poling their boat through swift water, dangerous rapids, and muddy flats. For Mardy and her young family, this was just the beginning of a life spent outdoors. A life of saying yes to adventure, no matter what others said she should do.